Drum And Barrel Heaters Are Used For Applications Including Commercial, Industrial, Storage, And More. Drum and barrel heaters are made of high quality materials for long lasting durability and corrosion resistance. Units provide efficient plastic or metal drum heating for application versatility. Insulated full-wrap design delivers heat uniformity and adjustability for content stability. Units maintain temperature for waste prevention without scorching or burning. Thermostatic shutdown prevents overheating for safety. Choose from Adjustable and Fixed temperature units. Gallon capacities range from 5 to 55. ETL, UL, CSA, and CE approved. Dimensions vary per model. 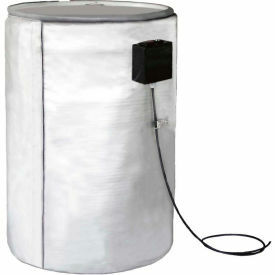 Best Value Drum and Barrel Heating Blankets Provide Temperature Controlled Fluid Protection For Drums, Barrels, Cylinders, and Other Storage Containers. These heating blankets deliver uniform heat distribution and prevent freezing damage for temperature sensitive materials. The heating wires are designed to maintain consistent temperatures and preserve content without scorching or burning for waste prevention. The PVC jacket with inner nylon mesh provides durability for years of lasting service. Poly drum safe. Available types are Adjustable and Fixed. Blue color finish. ETL approved. 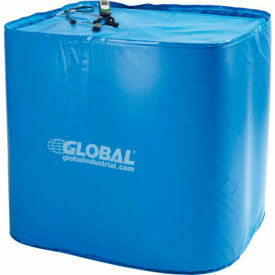 Powerblanket® Tote Heaters Efficiently and Safely Heat Temperature Sensitive Materials. Powerblanket® Tote Heaters have a heating element within the blanket that allows for more surface area contact, conserving energy and greatly reducing hot and cold spots. For safe, consistent heat for paints, roofing materials, chemicals, epoxies, resins, equipment, and pallets of any material. The advanced insulation prevents heat loss and will protect down to -40°F/-40°C. Units provide efficient plastic or metal drum heating. Insulated full-wrap design delivers heat uniformity and adjustability for content stability. Units maintain temperature for waste prevention without scorching or burning. Thermostatic shutdown prevents overheating. Includes removable top for ergonomic operator access. Gallon capacities range from 250 to 550. 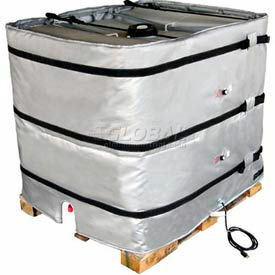 For use with Diesel Exhaust Fluid Tote, IBC Steel Tote, and IBC Tote. Colors are Black and Gray. ETL, UL, CSA, and CE approved. Dimensions vary per model. Powerblanket® Extra Hot Thawing Blankets Are Used For Thawing Frozen Ground, Melting Dangerous Ice Dams, Warming Vehicle Engines And More. Powerblanket® Extra Hot Thawing Blankets are made of heavy duty flexible carbon fiber material for long lasting durability and dependability. Quickly heat to a preset of 150°F/66°C. Easily installed and removed. Certified to UL/CSA/CE standards. Wide selection of 120 volt, 95 to 2750 watt units in various dimensional sizes covering 4 to 104 square feet are available for particular heavy duty heating or thawing need or application. Available in Black or Gray color. Powerblanket® Multi-Duty Thawing Blankets Are Used For Concrete Curing, Thawing Construction Sites, Melting Ice And Snow On Sidewalks, Warming Motors, Engines, Shop Floors And More. Powerblanket® Multi-Duty Thawing Blankets are made of lightweight flexible carbon fiber material for long lasting durability and dependability. Quickly heat to a preset of 100°F/38°C. Easily installed and removed. Certified to UL/CSA/CE standards. 120 volts, 40 to 1440 watt units in various dimensional sizes covering 20 to 144 square feet are available for particular heating or thawing need or application. Available in Black or Gray color. 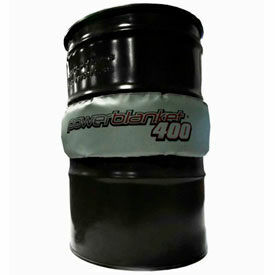 Powerblanket® HotBox Heating Containers Are Used For Applications Including Commercial, Industrial, Storage, And More. Powerblanket® HotBox heating containers are made of high quality materials for long lasting durability and corrosion resistance. Containers provide efficient pallet and bulk material heating for application versatility. Insulated full-wrap design delivers heat uniformity for content stability. Units maintain temperature for waste prevention without scorching or burning. Includes top and side doors for ergonomic operator access. Assembles easily for convenient portability and storage. 120 Volts. Colors are Black, Charcoal Gray. ETL, UL, CSA, and CE approved. Dimensions vary per model. Powerblanket® Gas Cylinder Wraps Are Used For Applications Including Commercial, Industrial, Storage, And More. Powerblanket® gas cylinder wraps are made of high quality materials for long lasting durability and corrosion resistance. 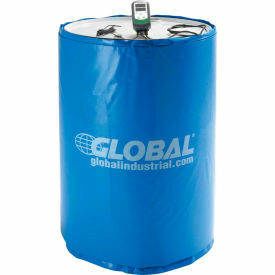 Wraps are used for insulating gas cylinders from harsh weather conditions. Insulated full-wrap design protects and optimizes gas cylinder efficiency by heating and maintaining temperature uniformity. Consistent temperature maintenance prevents waste without scorching or burning. Digital thermostatic controller allows ergonomic temperature regulation. Units eliminate unnecessary cold weather cylinder refills. Weight capacities range from 20 to 420 lbs. 120 Volt. Colors are Black, Charcoal Gray, and Gray. ETL, UL, CSA, and CE approved. Dimensions vary per model. 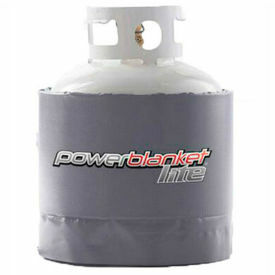 Powerblanket® Accessories are available for use with Powerblanket® Products. Powerblanket® accessories include Powerblanket® Digital Thermostatic Controller, an adjustable, thermostatic controller for greater temperature control; Powerblanket® Lite Caulk Warmer and Equipment Heated Pouch that heats up to four, 10.1 oz. caulk tubes; and Powerblanket® Vinyl Repair Kit, which can be used to repair the vinyl outer shell on Powerblanket® products. The digital thermostat controller uses heat probes for precise temperature measurement from ambient up to the maximum. 110 volt electric plug. HH-66 vinyl cement. 12 foot length, 3 inch wide vinyl roll. BriskHeat® Wrap-Around Tote Tank Heaters Are Non-Evasive For Use On Caged, Plastic Or Metal Tote Tanks And Intermediate Bulk Containers. BriskHeat® Wrap-Around Tote Tank Heaters speed up the flow of slow moving and uncooperative contents such as honey, molasses, lube oil and other viscous fluids without contaminating or scorching products0. 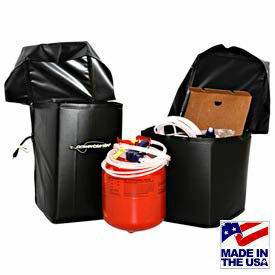 Fits any tote tank from 40" x 40" to 48" x 48" using adjustable nylon straps with buckles; 3 straps around the tank and 2 across the top. 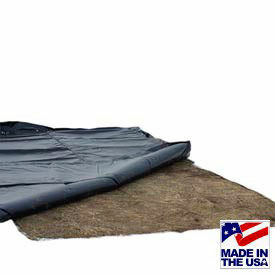 Made using silicone-cloth facing and liner with 1/4" fiberglass insulation. Features a hole designed for spigot. 2 separate heat zones allow adjustment of heater output when content levels lower. Built-in manual reset high-limit safety thermostat is set at 195°F for each heat zone. Includes 6'L power cord. Meets NEC 427.23 standards and CE 73/23/EEC. Optional Insulated Top Cover helps reduce heat loss and accelerate heat-up. Easily slides under buckles on top of Tank Heater for installation. Adjustable temperature ranges from 50 to 160°F. Height sizes are 36, 42, and 48 inches. 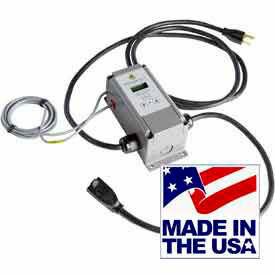 Available with120V or 240V operation. 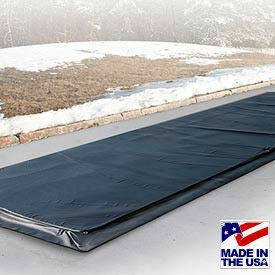 Powerblanket's® Heat Spreading Technology captures the heat most other systems let escape. The end result is a more efficient and reliable method for thawing and heating pipes, even in the most severe weather conditions. Effective at temperatures down to -40°F/-40°C, Powerblanket® heated pipe, valve & wellhead wraps allow workers to shutdown equipment for repairs without the fear of lines freezing. Engineered for thawing & freeze prevention Powerblanket's® "SMART" RAPID-RAMP® HEAT TECHNOLOGY pipe wraps bring pipelines and materials to desired temperatures faster than conventional methods, allowing for rapid thawing and more efficient flow control. Flow control is critical to any oilfield, mining, or manufacturing operations. Downtime costs due to frozen and broken lines and pumps can be enormous. Powerblanket's patented GreenHeat Tecnology delivers a barrier of uniform directional heat where it's needed most - to prevent fluids from freezing and to ensure optimal flowability. No more expensive crews to install heat trace and insulation. Repair work won't involve tearing everything off and starting over from scratch. Powerblanket® PIPE WRAPS are easy to install, uninstall, and reinstall at only a fraction of the cost of expensive heat trace systems. Powerblanket® protects wellheads, tanks, manifolds, pumps, tubing bundles, valves, and pipelines from harsh outdoor weather. 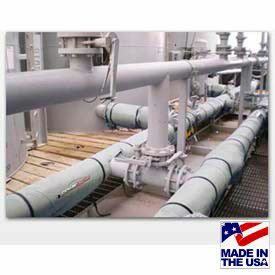 Heat & insulate process flow equipment with Powerblanket's flexible wrap-around heaters to ensure maximum up-time. 120 Volts. Certified to UL/CSA safety standards. Powerblanket® Spray Foam Heating Boxes Are Used For Warming And Maintaining Spray Foam Canisters And Hoses To Efficient Temperatures. Powerblanket® Spray Foam Heating Boxes are made of durable flexible carbon fiber material for long lasting use and dependability. Provide constant and even heat distribution for spray foam systems, allowing for longer use and greater efficiency. 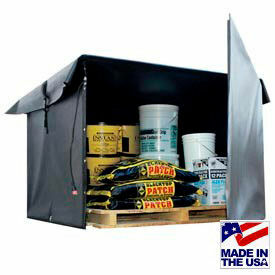 Provide ample room for storage of canisters, hoses and guns. Certified to UL/CSA/CE standards. Lightweight and easily portable units are available in Black or Gray colors and various dimensional sizes. Powerblanket® Drum And Barrel Band Heaters Are Used For Applications Including Commercial, Industrial, Storage, And More. Powerblanket® drum and barrel band heaters are made of high quality materials for long lasting durability and corrosion resistance. Heaters accommodate epoxy curing, welding preparation, manufacturing processes, and more. Insulated full-wrap design delivers heat uniformity for content handling and stability. Units maintain temperature for waste prevention without scorching or burning. Features high efficiency aluminum heat-spreading technology. Gallon capacities range from 1 to 55.120 Volts. Charcoal Gray. ETL, UL, CSA, and CE approved. Dimensions vary per model.